Melt butter in a large pot on low heat – about 3-4. When the butter is melted down into liquid, add in the marshmallows/marshmallow flluff. Stir until all marshmallows are melted down and add in cinnamon, vanilla, nutmeg & salt. Once all is mixed together, add in the cereal, about 2 cups at a time. Keep adding the cereal until you have a nice consistency – if it’s too runny, add a little extra cereal until the marshmallows have covered the rice crispies evenly. Remove the mixture from the pot and press into a 13×9 greased (i used butter to grease) glass pan. I wet my hands with water so that the mixture didn’t stick to my hands when molding the treats into the pan. Place in fridge for 30-60 minutes, or until the rice crispy treats have hardened up. Once ready, take out of fridge and cut into desired pieces – I cut into rectangles. Place on parchment paper. For the butterscotch: put butterscotch chips in a double broiler until melted down. 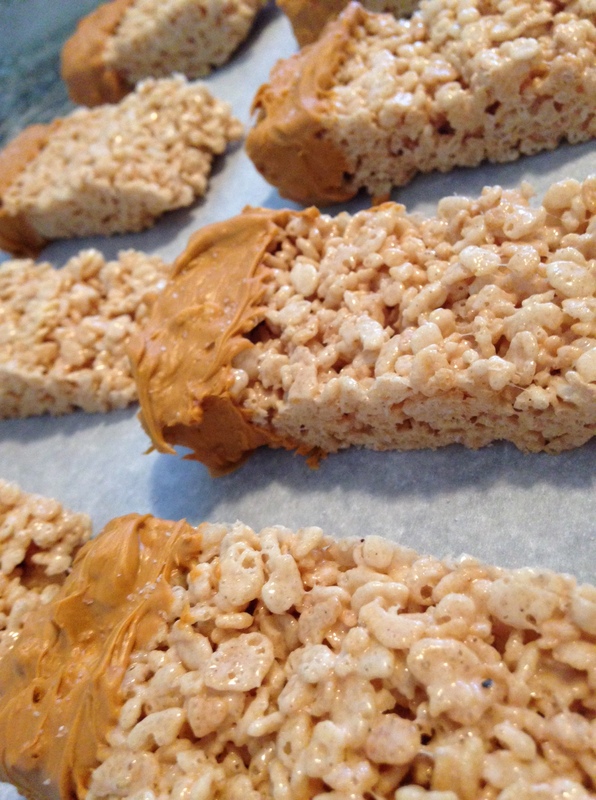 Dip rice crispy treats and cover with desired amount of butterscotch. Place on parchment paper and sprinkle with a little sea salt. Let set until butterscotch has hardened (or put in fridge to harden faster). Enjoy!